Michael Bublé will headline his seventh music special for NBC this March. The network announced the Grammy Award-winning singer will star in a primetime special set to air on Wednesday, March 20th at 10pm ET/PT. The upcoming special’s simply titled bublé! and, according to NBC, will be his “most personal” special to date. The special’s confirmed to include six songs off his new album, love, including “When You’re Smiling” and “Such a Night.” love was released in November 2018 and entered the Billboard Top 200 Chart in the #3 spot. To date it’s sold over 300,000 copies. 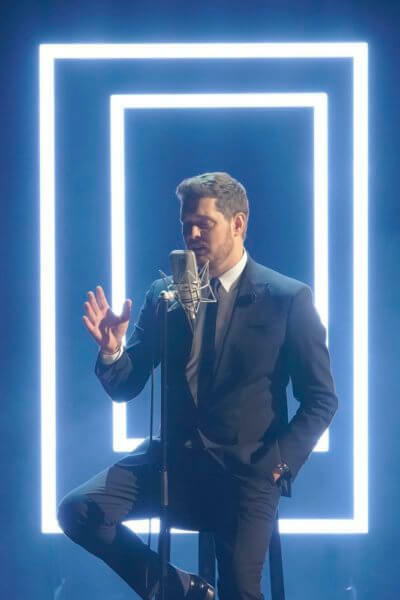 The 2019 primetime special will also feature performances of his romantic standards, such as “My Funny Valentine,” as well as a duet with guest artist Cécile McLorin Salvant on “La Vie en Rose.” In addition, fans can expect to hear Bublé sing “Fly Me to the Moon,” “You’re Nobody ‘Til Somebody Loves You,” “Haven’t Met You Yet,” “Home,” and “It’s a Beautiful Day” accompanied by a 36-piece orchestra. bublé! is executive produced by Michael Bublé, Bruce Allen, and Brad Lachman. Michael Bublé earned his first career Grammy in 2007 in the Best Traditional Pop Vocal Album category for Call Me Irresponsible. In 2009 he also won a Grammy in the Best Traditional Pop Vocal Album category for Michael Bublé Meets Madison Square Garden. His third Grammy win came in 2010 for Crazy Love, and he earned his fourth Grammy for To Be Loved in 2013.